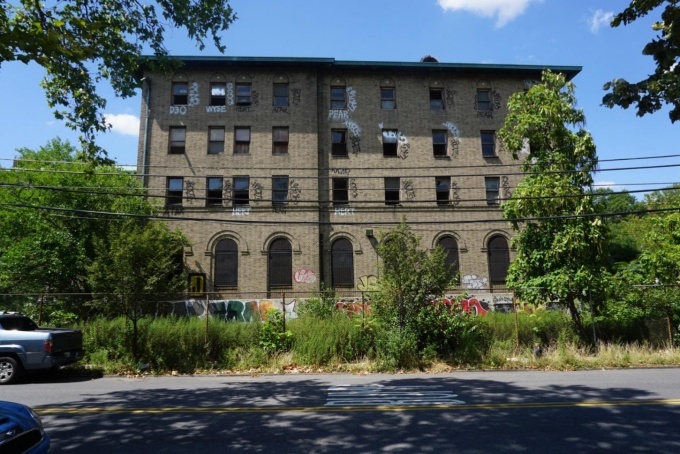 The city has selected a team to carry out the transformation of the former Greenpoint Hospital complex into a mixed-use, affordable housing development, bringing the project one step closer to fruition. The team, selected by the city’s Department of Housing Preservation and Development, includes The Hudson Companies Incorporated, a real estate firm, working alongside Project Renewal, a nonprofit helping homeless New Yorkers. St. Nicks Alliance, a local community group, is also part of the team. 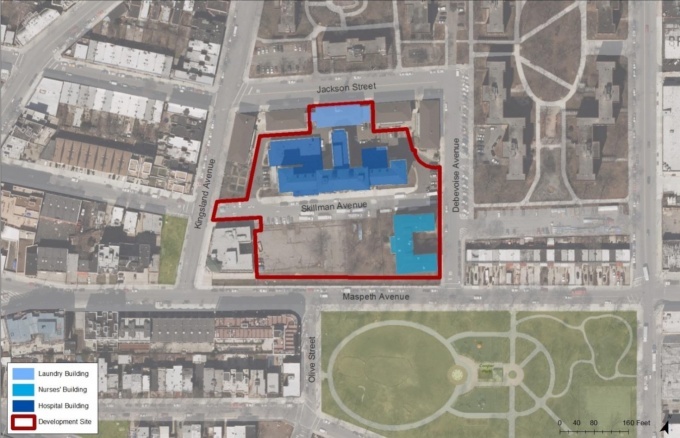 The selection follows a request for proposals the city sent out last year for ideas on developing the 3.4 acre site, situated in the East Williamsburg/Greenpoint area at 288 Jackson St, and mostly abandoned for more than three decades. Two new multi-family buildings will be built at the site, providing over 400 homes for extremely-low, very-low, and low-income households. 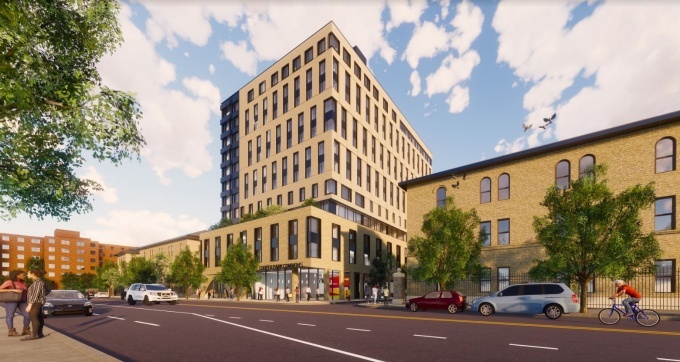 One building, with 267 units, will rise on vacant land on the site’s Skillman Avenue side. The other building, with 136 units, will be built over a hospital boiler building, set to be demolished. The new buildings include a community center, space for workforce development, and a cafe. The main hospital building, currently a men’s homeless shelter, will be converted into affordable homes for seniors, with 109 units in store. The shelter, meanwhile, will be relocated into an existing building on site that will be rehabilitated to accommodate for two more shelter programs. The three residential buildings, in total, provide for approximately 512 units. As part of the residential program, 30 percent of the units will be set aside for homeless New Yorkers exiting the shelter system. The build-out will be done in two phases, with the Skillman Avenue side to be developed first, followed by the main hospital building site. 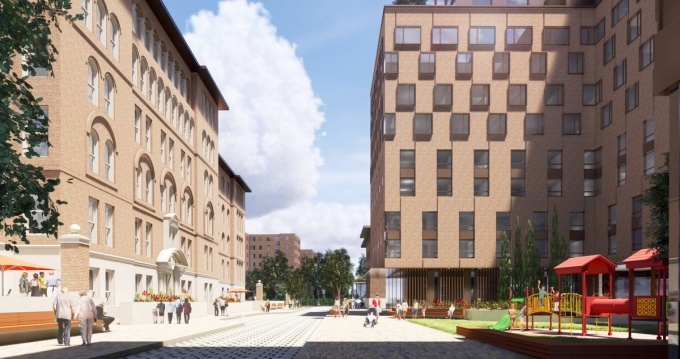 The project is one of several by the city that aims to redevelop the scarce supply of publicly-owned land, and comes after years of demands to turn the complex into residences since the hospital closed in 1982. Mayor Bill de Blasio, who announced that the city would seek to develop the complex last September, said the site was more than ideal to develop. “It makes no sense in a community desperate for affordable housing that this prime site has been sitting there for all this time,” de Blasio said. The city expects construction to start in 2021. The Greenpoint Hospital complex is likely to be rezoned to allow for more density and bulk than permitted under current zoning, which requires a lengthy public review process.